Today, I want to publicly share for the first time that I have sold my software company, Long Tail Pro. In February of this year I sold a majority share of the company for a significant sum of money, the kind of exit that can have a big impact on one's life. I've shared the history of Long Tail Pro and the genesis of the idea for a better keyword research tool on my blog a few times. In particular, for the history of the company up to 2012, you should read this blog post and for a good overview of how I bootstrapped Long Tail Pro read this one. However, in a nutshell, I came up with the idea for a better keyword research tool because I was building lots and lots of little affiliate sites for myself, and needed a way to find and cherry pick easy to rank for keywords much faster than existing software would allow. Because I was not only the business owner, but also the end user, I was able to develop an excellent product from the stand point of potential customers without much feedback from them. I understood the target market on a very deep level, because I was one of the users in the target market. I should also be very clear, that I am not a programmer. I did not code a single line for Long Tail Pro. I am living proof that you don't have to be a coder in order to build a successful software company and have a significant exit. So, how did I build a successful software company when I'm not a developer? I outsourced. I've written about how I hired and the mistakes and successes that I had with programmers in an in-depth blog post right here. I basically made the mistake of hiring a really cheap developer and things did not go well at first. The product was working long enough for me to start selling it and validate the market. But after about 2 weeks the software “broke” and I had to go back to the drawing board. After having my source code held hostage by the original programmer, I made the decision to find someone new. This was one of the best decisions I ever made, and this new developer stuck with me until the company was sold. I could also go into great detail about how I launched the company and have grown it over the past 5 years. However, I'd like to focus primarily on the sale of the company and the details behind it. I've never openly shared how much revenue and profit Long Tail Pro was making as a company. However, now that I've sold most of my ownership stake I'm willing to share a few more details. Hopefully this kind of data is beneficial to someone considering starting a software company. Below you will find a graph of the revenue and net profit of the company on an annual basis since the company was started. The revenues in 2011, the first year of the business, clocked in at about $44,000. Both revenue and profits have increased each and every year that I've owned the company. I've always been 100% owner of the company and so it certainly feels good to look at a 5 year graph and see the growth that has been achieved. I fully expect the new ownership team to continue the growth trend for Long Tail Pro. Deciding to sell the company was not an easy decision. And in fact, I hadn't 100% decided to sell the company until I received a great offer. Here's the story behind how and why I came to the decision to sell Long Tail Pro. When you have lived through a number of major Google algorithm updates, like I have, you are constantly thinking about what the worst case scenario is. Long Tail Pro is a software that has to be constantly updated to keep up with changes made from Google. After 5 years, I started to think that perhaps it would be smart to take some risk off the table. The risk of Google changing something that I couldn't fix. Or there could be other “black swan” risks that I just don't know about. 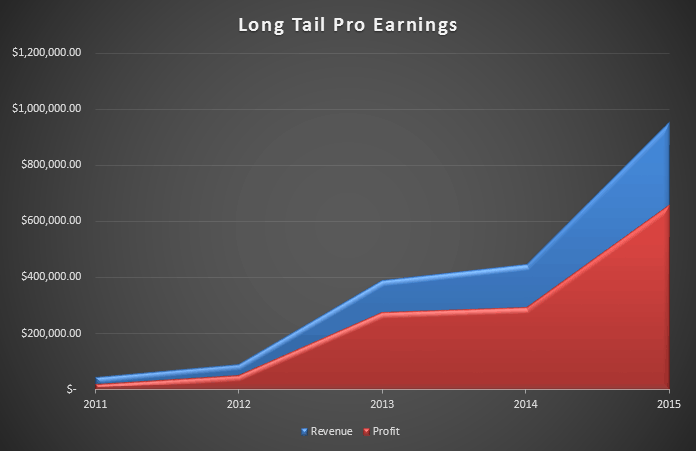 In addition, as you can see, Long Tail Pro has always been profitable and financially has a great business to me. However, after running a business for 5 years, the excitement starts to wane a bit. I was becoming less motivated to run the same business day to day by the end of 2015 as I had been since early 2011. (Luckily, I had hired Jake Cain to help keep the company moving forward and 2015 was the best year ever for the business. Jake continues to work with me as employee on Amazon FBA, websites, and other projects…but is no longer involved in Long Tail Pro post-sale). So, for these 2 reasons: taking risk off the table and I was just ready for something new was what made me start thinking about selling the company. Right about the time I started thinking about selling, I was planning to attend Rhodium Weekend in October 2015. Rhodium primarily is geared towards people interested in buying and selling web properties. I've attended a couple of times and its a great conference run by Chris Yates. One thing led to another, and Chris eventually invited me to share some details about Long Tail Pro at the conference in front of a few web brokers for a mock valuation session. I think it was a really good experience getting valuation advice at the conference from David Newell at FE International, Mark Daoust at Quiet Light Brokerage, and the guys at Flippa.com. Again, this was a “mock” valuation session, and I still really had no intention of selling the company. However, after the conference I started getting people contacting me saying they were interested in buying my company! In particular, 2 potential buyers were very interested and wanted to talk numbers. One of the potential buyers (the one that eventually bought the company), hadn't even attended the conference, but had heard through the grapevine that I might be selling. I still hadn't really decided to sell the company and had never officially listed it for sale anywhere. However, as I discussed details with the group that eventually ended up buying the company, the more I warmed up to the idea. One of the main reasons I went from being unsure about selling the company to feeling confident about selling the company was due to the potential buyers. I had known the potential buyer for over 3 years and we had done many business transactions in the past. This was a close online business associate that I was confident would take good care of my company. As he shared more details about his ideas for growing the company, I could see that we were on the same page and this pushed me over the edge about finally letting go of my company that I had built from the ground up. After discussing these points with the potential buyers, these were the exact strategies that they saw to improve the business as well. Knowing that they shared the same strategic outlook that I did, really made me more comfortable with the sale. They proposed a purchase price and we negotiated price and other details (selling financing, remaining ownership, etc). I have to admit that I was sick of talking to my attorney and accountant after this period of time, but obviously these are critical components to selling the company. There are lots of legal and tax implications and I wanted to make sure that I had advisors looking out for my best interests. I was very happy with the transaction, and I know that the buyers were as well. In addition, what really made me happy about the deal was that I was able to keep 20% ownership of the company. So, I sold 80% of the company, but get to keep 20% on a more passive basis going forward. I felt like this was important for me because I still believe in Long Tail Pro and see tons of growth potential. This allows me to hand off the day to day operations to someone else, but still enjoy some of the potential upside. In addition, I still own 20% of the company, so I continue to get dividend payments on a regular basis for that remaining ownership percentage (on top of my seller financing payments). Then of course, if the new buyers decide to ever sell the company after they take it to a new level, I will get 20% of that future exit. Overall, I'm very pleased with the deal. So, you may be wondering how involved I am with the day to day operations of Long Tail Pro. The truth is that I am no longer involved very much in the day to day operations of the company. As part of the deal, the new team wanted full control over the company. And this is the way it should be, the new team has their own vision and goals and is in full control of Long Tail Pro. I still offer strategic advice when asked or may point certain things that I notice in the business, but in general, I'm no longer operating the company. So, this is the reason you won't see me in the Long Tail Pro Facebook group answering questions or answering support tickets. This actually is very smart in business terms anyway. A company is much more valuable if the original owner is not the sole face of the company. Long Tail Pro is more valuable if it is not dependent on my reputation. As a result, I am no longer involved in the day to day operations of the company. As mentioned, I no longer have any major responsibilities at Long Tail Pro. I do have some ongoing commitments related to blogging and mentioning Long Tail Pro on NichePursuits.com, but these are very minor in terms of time. Right now I am mainly focusing on creating and launching physical products to sell on Amazon. I've shared some of my income reports from my Amazon FBA business in the past, and I'm still very bullish on the potential here. I've launched several products on Amazon since selling Long Tail Pro and expect to launch several more before the end of this year. In addition, I continue to grow my affiliate website portfolio and have invested in a few sites. I still really enjoy seeing these websites climb the ranks in Google. And finally, I am starting to get the itch again to start a new software company. I wanted to take a bit of a break after selling Long Tail Pro before diving right into another software project. So, now that it's been about 7 months, I feel like maybe I should start the process once again with a new product that is exciting to me. In fact, last week, I just spent a few hours talking to my developer that helped me build Long Tail Pro and discussed a new potential software idea with him. This idea may or may not come to fruition, but I definitely see myself getting back into the software game in the next 12 months. I just feel like I've learned SO much in running my first ever software company, that it would almost be a waste of all that education to not start and run another software company. Or maybe I should just take a few extra months off and enjoy the time with my wife and 4 kids!? Either way, I really like the options exiting my software company has provided me. I truly hope that some of you out there reading can learn a bit from my experience and feel inspired to go out and create something great that can provide you with lots of amazing options. This is fantastic news. Congratulations. Really happy for you. Hey Spencer – Congrats on closing this deal and this chapter of your life! I sure have appreciated following you and Niche Pursuits and I continue to learn so much. Thanks for being such a great teacher for so many us! Best of luck moving forward and I look forward to seeing what you come up with next. I love this kind of “success story” – You really deserve it ! Are you already thinking about a new software or do you prefer focusing on FBA and niche sites only ? Thanks Remi. I discuss my plans in the “What Now?” section. And where’s the “What’s Next “section? Haha, really? Its the big bold header at the end that says, “What Now”. Congrats on the sale! Thanks for sharing and this is definitely motivating. Glad you find it motivating! Been using LTP for years. Still going strong with it. So congratulations! You should consider starting a SAAS app for ecommerce/Amazon. Blowing up right now. I’m sure I could help you brainstorm some ideas on the Amazon front. Agreed, ecommerce/Amazon is ripe opportunity for software entrepreneurs. Now, what I wanted to find out is if the sell is in anyway going to affect us the users? And also, if after the new features is added, are we also going to start making the monthly/yearly payments before we can use the software? I mean we old users. Finally, do you have any product that teaches more about your FBA business strategies? Any resources? Thanks and good luck with every other thing you’ll be getting into. The sale happened 7 months ago, so any impact on existing users would have already happened (should have been little to no impact). Is your internship still on going? Can one still join now? I am not involved in the authority machine internships anymore. Just wondering, what sort of cost was associated with that of the accountant and lawyer? Also, if you could divulge on the tax implications of such a deal? I find it really bizarre that so many entrepreneurs, especially those like us who focus on affiliate marketing and the industry surrounding it, talk very little about tax and how best to deal with each situation. I’d be really keen to read about how this all worked out including the costs of the accountant/lawyer as well as the tax implications from the initial sum as well as the monthly financial payouts and of course how the dividends would work from a tax perspective. I appreciate some of the finer details will be way to confidential and personal to your business, however just at a broader scale it would be massively beneficial. Costs can vary on your accountant and attorney, and how much time a deal can take. I spent roughly $20k on attorney and accountant fees to get the deal done. Very interesting, I think a podcast or a guest post would be absolutely fantastic, I realise it’s like opening pandora’s box when talking about tax, since your audience are international and laws and regulations change all the time. Yep, I agree…its a good topic. Transparency was the key highlight of your blog, besides the informative articles. Wishing you the very best for your future endeavours. So you gonna disappear to a tropical island in the pacific now? Because that’s what I would do lol. Congrats Spencer! Thanks for your information and email from amazing software. Congrats Spencer! Slapping an arbitrary 10x multiple on the 2014-15 profit range from the graph, I’d be thinking about retirement myself. 😉 Enjoy the fruits of your labor. Thanks Chris. It wasn’t 10x, but it was a nice amount based on 2015 profits. Most good businesses start with the idea of eventually selling at a profit… and it’s great that you retained a portion of LTP… this will at least keep you connected to your creation. Correct, nothing changes for customers locked in at the lower monthly rate. Thanks! I am happy for your success. LTP is really an awesome software. Good luck for your future business. Wishing you the very best for your future endeavours. Congrats on the sale Spencer. LTP was (and still is) and incredible product. Support has been great over the years as I’ve needed minor help. Happy for you and the family. Proof that having a great product with great support is of equally great value. Thanks for the education you have given me and helping me to make the “first step” into this business! I am truley grateful and inspired! Congrats to you! Oh and take the extra time off with the family! This is a major announcement indeed. Long Tail Pro without Spencer Haws is something difficult to imagine. Again, if it’s in the best interest of buyer and seller then it’s all good ! Good luck Spencer on your next venture and I am sure you will keep inspiring people all over the world ! Spencer, great read and nice to see the earnings graph. I think you hit the nail on the head with LTP adding value. All too often I think web marketing can be quite superficial – I think creating a true value add is the secret. I look forward to future updates! Its all about value. And the truth is that there are TONS of ideas that will add value to end users. Its just a matter of finding a solution that the market actually will pay for, then building a quality solution and marketing it properly. Thanks for the motivating read, Spencer. I appreciate that you shared some real numbers! Congrats Spencer, thank for sharing the real insight of selling LTP. I hope will get the same service from new company as you had provided. Using it for a long time. Thank you for sharing your journey in detail. Good luck. Toni, I agree that it requires you to give up some control and have some trust to let others code something for you. But its really the only option when you are not a coder. Did you protect us to require the new ownership to honor the contractual commitments we had with you or were you silent or gave it away. Any deal you got when you bought Long Tail Pro remains the same. Remember, I sold the company 7 months ago, so you likely didn’t even notice. Inspiring story about need assessment to fulfilling the need in blogging sphere. This also teaches us about business management vis a vis emotions management. Taking a decision to depart from a business which you developed like a child needs a great courage. Definitely there are some more fantastic things yet to be come. Best wishes for your future endeavors dear Mr.Spencer. I think you should definitely start another software business, AND take the next four months off to be with your kids. Great advice Eric. I think there is a lot to be said from taking a step back, focusing on something else, and then coming back. Congrats on the seller. You a millionaire now, my goal one day. Hi Spencer! Well done on an awesome journey. I always love that as entrepreneurs we get to think of something, create that something and generate income from that something – and then in the end, that something has a huge value because of the sales made. Terrific stuff. really cool story and congratulations! Woooow, Spencer! Great job! Being able to retain 20% of the company was an amazing deal! That is some amazing news. Best of luck and look forward hearing from you in the future. Thanks for supporting Long Tail Pro for such a long time, Ralph! This is fantastic news. I am Really happy for you. Are you really thinking about launching new software product ? Had the pleasure of meeting one of the new owners and hearing about the future plans – definitely sounds like a win-win-win deal! I know you consulted with a variety of brokers but which one did you use to do the actual deal, or was it done privately? I’ve used FE International as well to sell a few of my projects and it was definitely a huge difference, compared to using say Flippa. If it’s not a secret – what was the multiple you sold it for and is there an earn-out? The deal was done privately – without an outside broker. Contact me privately for any additional details. Congratulations Spencer. Look forward to following your next adventures. So, off to the next one , Ha! Check out how IOT & Big Data is integrating and how a product/platform like “Neura” can provide a service via API to anyone that wants to use the data+AI in their products & services in a meaningful way! But it’s like missing our friendly neighbourhood. The success of your software company is fully dependent on your friendly nature. Now it feels like Longtail Pro as a new software. We are hoping for the best from the new one. Add me to the “scared newbie” column. Hope the new owners continue to do a great job with LTP. Also, if you were to put all those years of knowledge creating/running/selling a software company into a web based training.. I’d definitely buy it. Many congratulation on such a successful buisness deal.Best of luck for your future endeavors. I’ll put a good word in for existing users. Spencer thanks for your response.Now can we expect that one last time life time subscription option for old users of long tail pro who purchase the product license will be given? Also no such information was provided to existing users before migrating to new plan.It is requested to give same life time option one time to existing subscribers. Once again congratulations on such a successful deal and wish you all the best for future projects. I have contacted you through Contact page in this website. I will be thankful if you can see my query there and reply. expecting your post regarding how you find products! Haha, you are right, I should have more time to discuss FBA. Anyone else interested in hearing more? Congratulation Spencer for making this big deal. Hope very soon we will get something cool from you ! Best Of Luck ! Hi and congratulation for your deal! I myself is a LTP user and I’m very happy about the product. Why not take a look at other similar sites… such as eBay or Alibaba? Why not show us how to build up a business around these sites..? Congrats Spencer! The success story and the way you told it is very inspiring. It’s a major breakthrough in your life and I can understand how you feel when you offload such a major responsibility. Hi Spencer, what a feat! This is an inspiring move. It definitely proves that with determination and focus one can achieve ones desires. Good luck in your future endeavours. I use Long Tail Pro on a regular basis and you have built a great tool. Congratulations on the sale and i look forward to reading about your new software company over the next 12 months. Nice update Spencer. It was very insightful for someone like myself who may try to get into software in the future. If/when you decide to create a new software program it would be great to have a case study on it. I know you said you might already have a software idea in mind but it would be really beneficial to see how it is that you decide on a software to build. Kind of like doing a “niche site project 1.0” but for your new software. Yep, interesting idea. Thanks Alan! Thank you for the great insights and congrats on your success with LTP! As a software engineer it’s inspiring to see that it’s still possible to make money with a software product/Desktop solution. Is there any timeframe for the online/cloud version of LTP? I keep thinking its going to be released any day now. I really think 2 weeks from now is a possibility. Excellent! LTP is a great software. I’m glad you got rewarded for that in multiple, and that you will keep a minority share in the future of the tool. Thanks for the read. Very enlightening. May I ask, what type of document do you sign with a developer in order to clarify that the software that he/she will write, will be your property? Everything should be written out and discussed in detail before the job (including who owns the code, etc). My original contract was through Elance believe it or not, and they provided some standard docs/procedures. I see. Thank you for your reply. So you used those same pre-formatted documents to sign your 2nd deal too? very helpful at all for me..
A big congratulations on the successful sale! What an amazing story! Imagine for a second that you had stayed with your job in 2011 – mind blowing right? I have enjoyed following you and your journey since I first came across your blog back in aug of 2012, and appreciate your openness! Thanks Christoffer for following along! I’ve enjoyed the comments and emails we’ve exchanged over the years. Thank you so much for great post. The post very helpful for me. Spencer, congratulations! That’s great news. I’m just getting started with LTP, so I don’t have a huge history with your company or the product. However, so far so good and its great to see hard work pay off. Very inspirational! Hello Spencer, Google officially throttled Keyword Planner data for low spending AdWords accounts. Therefore if you are a free user of the tool or you do not spend a substantial amount on ads you will not get any search results when using the tool. This is going to cause problems for those using longTailPro . What are your opinion on this matter? We’ve anticipated that as a possibility for a long time, so we have alternative solutions. We hope the impact will be minimal for users. I hope there is a good way to deal that issue, but unfortunately there are other problems with the Google keyword tool, such as the grouping together of similar keywords and combining them into one “result”. Congrats on your success, many more to come. Just landed on your Niche Project 3.0, following it diligently and love the content and advice being shared by your team. Hey Spencer, big news so far on NichePursuits indeed! All the best for all your future endeavours – keep inspiring! One question though, when LTP moved to Moz for ranking metrics, there was a mention of Web version of LTB; do you know what are the plans for it. I believe with 20% still in the company you would be involved in brainstorming of its implementation? The web based version may be released in the next week! Thanks Spencer – looking forward to it! I remember the phone call when you told us. Was pretty exciting stuff. Happy for you, brother! Spencer Haws and Long Tail Pro are almost synonymous, but now that has changed… for the better, for Spencer and also Long Tail Pro, but it has left a gap somewhere. Await your next wonderful product Spencer, will certainly give it a shot. I am interested in buying Longtail Pro but cant afford the annual plan. Is it effective without access to Long Tail University ? You got out at such a right time. The new owners must be kicking themselves. The tool is pretty much useless now with Google throttling the data. I own a copy and it does nothing, no data….nothing. Building niches sites are going to be harder now without Google keyword tool. Great article. Highly recommend LTP for anyone needing a keyword research tool, especially after the recent update to Google keyword planner which no longer shows precise searches per month (incredibly annoying!). Any more projects down the line Spencer ? Great decision. Your idea about the software that you might launch is seo related? Congrats! This is really inspiring. I’ve been a long time fan and I’ve been using Longtail Pro for about a year now. Love the software, unfortunately do not feel the same about support. It was slow and has not been helpful at all. If the software wasn’t so great I would consider cancelling after my experience.